This nostalgic two-story bungalow's facade is enhanced by a charming gable, twin dormers, and a wrapping front porch. Bay windows enlarge both the dining room and the master bedroom, while the vaulted great room receives additional light from a front clerestory window. The kitchen features a practical design and includes a handy pantry and ample cabinets. A nearby utility room boasts a sink and additional cabinet and countertop space. 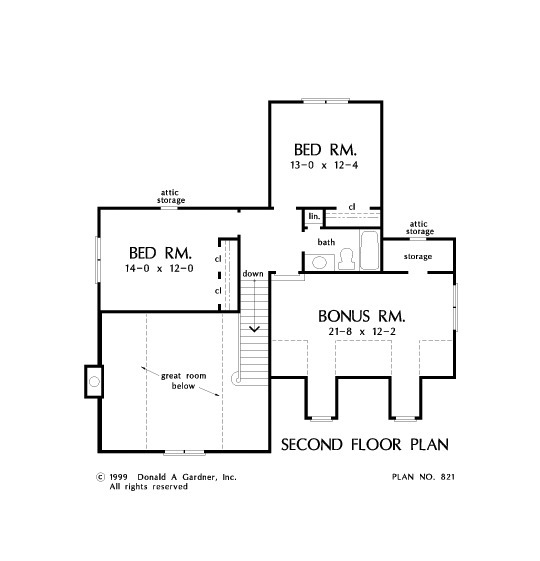 Located downstairs for convenience, the master suite enjoys a private bath and walk-in closet. Upstairs, two more bedrooms and a generous bonus room share a full bath. 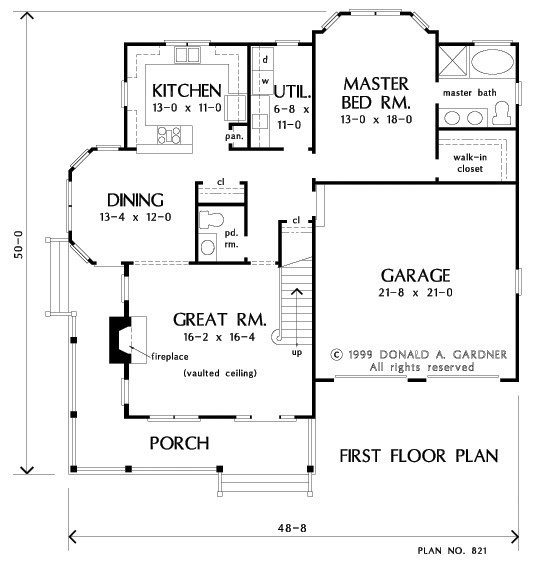 1st Floor: 1293 Sq. 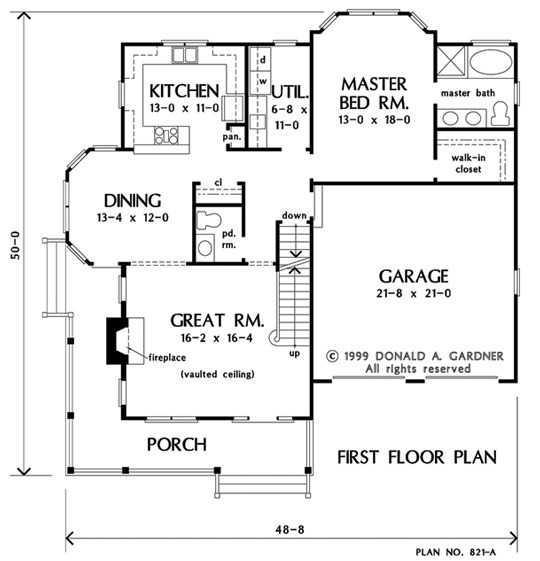 Ft.
House Dimensions: 48' 8" x 50' 0"
Great Room: 16' 2" x 16' 4"
Great Room (2 Story): 16' 2" x 16' 4" x 20' 0"
Kitchen : 13' 0" x 11' 0" x 9' 0"
Utility Room : 6' 8" x 11' 0" x 9' 0"
Bonus Room (Vaulted): 21' 8" x 12' 2" x 9' 0"
Bedroom #2 : 14' 0" x 12' 0" x 8' 0"
Bedroom #3 : 13' 0" x 12' 4" x 8' 0"
Porch - Front : 26' 8" x 6' 0" x 0' 0"
Storage (Bonus) : 8' 4" x 3' 8" x 0' 0"